I have been awaiting a new Un-set for a long, long time. As a kid first getting into Magic: the Gathering, the original Unglued fascinated me. 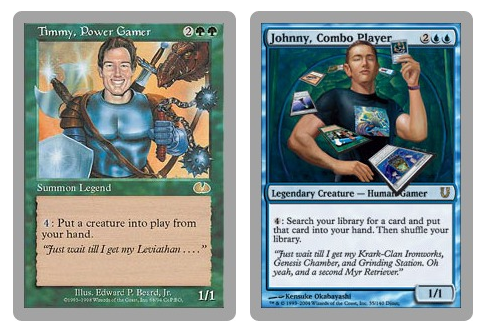 The silver-bordered cards were goofy, and despite not getting all of the jokes, they stood out in stark contrast to the serious, sometimes gruesome cards that first interested my friends and me. Then came Unglued. And what timing! By the release of Unglued, I was I’m deep. Rather than a casual collector admiring Magic cards on the side while playing Pokemon, I had an actual group of friends to play with. We played a lot, and Unglued was no exception. I still remember fondly buying boxes of Unglued for ~$30, spending a night drafting and chugging sodas (one of the two was a bad idea, and it wasn’t the draft). This year, Magic is celebrating 25 years of spell-slinging, and it’s hard to believe I’ve been playing and collecting these pieces of cardboard for most of those years. To celebrate, Wizards is doing a lot of things I was frankly sceptical we’d ever get. Not only are we going back to Dominaria, but Rosewater has finally performed the necessary witchcraft to convince the rest of WotC to give us Unstable, the next – and hopefully not last – Un-set. With no rules, Wizards can go completely ham. I thought I would share a few of my predictions for some of the things we may see in the newest Magic gag set. Whether or not any of these wishes come true, Wizards of the Coast will surely have plenty of surprises in store for us when the set releases this December. Unglued gave us Timmy, Power Gamer. Unhinged gave us Johnny, Combo Player. It only follows, then, that Unstable will bring us Spike, the third and final psychographic profile used by Wizards of the Coast to categorize why players play the game. Spike plays to win. Spike enjoys winning. To accomplish this, Spike will play whatever the best deck is. (…) To Spike, the thrill of Magic is the adrenaline rush of competition. While we may very well get Spike in the form of a creature—like Timmy and Johnny before him/her—I don’t think that’s what we’ll get this time around. The release of Unhinged was still three years off from our introduction to planeswalkers in Lorwyn block. In a world where planeswalkers are now the primary face of the game, it makes sense that Wizards would modernize the idea by giving Spike his/her spark. Another, perhaps more exciting, possibility is that Unstable brings all three player types as walkers. This would give Wizards an easy starting point to develop a full cycle of goofy planeswalkers. Then again, Spike is always okay with wielding greater power than the rest of the crowd, so we’ll just have to wait and see. This one’s pretty straightforward. We’ve recently seen pressure from the community to print less of the Gatewatch, with WotC eventually announcing that they would take a back seat for a while. And of course, in Hour of Devastation, we got to see their defeat at the hands of Nicol Bolas, God-Pharaoh. 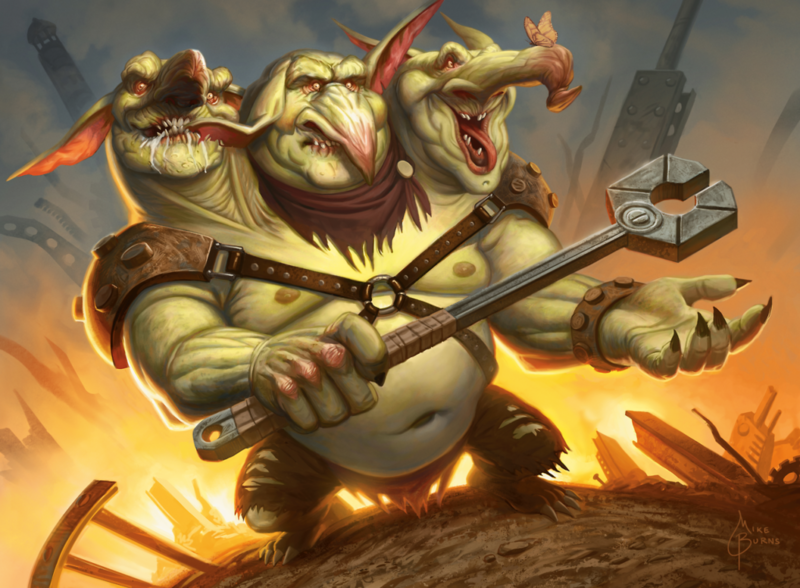 While we are yet to learn what becomes of each member of the Gatewatch, Unstable will be the perfect opportunity to kick them while they’re down. Not only that, but the community has no shortage of Gatewatch-centered memes and nicknames for Wizards to pull from. I fully expect to see a plethora of jokes at the expense of our recently-defeated planeswalkers. On the surface, Un-sets might look like fun and games, but they actually do serve a purpose beyond fan service. In the past, Unglued and Unhinged both provided R&D opportunities to play around with mechanics that are more difficult to test in Standard-legal sets. One of the original goals for Unglued was to give a home to cards that were considered unplayable for various balance, design or logistical reasons. But the game has continued to change, and Wizards has continually worked to open additional design space (both graphically and in game play). The result is that ideas formerly exclusive to Un-sets have made their way into the world of black borders. 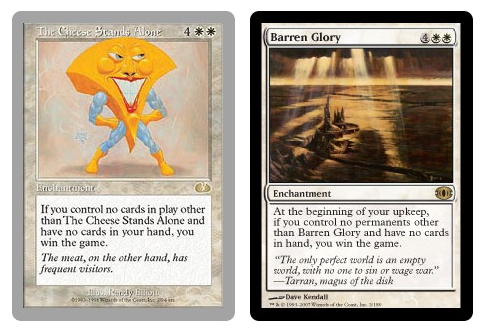 For example, The Cheese Stands Alone eventually received a (mostly) functional reprint as Barren Glory. Many cards in Unhinged featured characters bursting from the image box, an idea that would come back several years later when planeswalkers were introduced in Lorwyn-block. Among a number of other ideas, both subtle and overt, you can even see the precursor to meld with the biggest, baddest, nastiest, scariest creature we’ve ever seen, B.F.M (Big Furry Monster). Rocket-Powered Turbo Slug‘s “Super haste” gave us a similar mechanic to the cycle of Pacts. My prediction is that Wizards will up the ante this time around, sneaking a number of ideas we may or may not see make their way into Standard-legal sets one day. 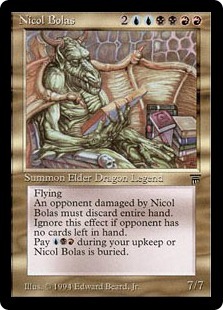 Now this is the Nicol Bolas I remember. When I was a kid, Nicol Bolas was the book-loving nerd among the class of Elder Dragons. In modern times, however, Bolas is more or less the top dog, serving as one of—if not the—central villain in the game. 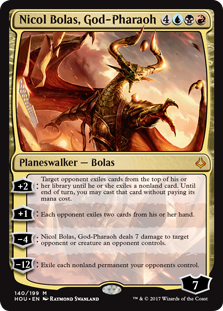 Bolas has seemingly endless power to deceive, and can even defeat planeswalkers. What better time, then, to knock him down a bit. Wizards has already shown us they are willing to have fun with the God-Pharaoh with their giant game of Magic at Grand Prix Las Vegas that was used to spoil cards from Hour of Devastation. The event certainly hammed up his evilness, complete with a human in horns portraying Bolas. Unstable would be a great opportunity to poke a little fun at the Elder Dragon. Depending on who you ask, one of the more exciting additions to Magic: the Gathering since Unhinged has been the introduction of the Masterpiece series. While some have been better received than others, the idea of incredibly rare, alternate-art cards would fit perfectly in Unstable. In addition to alternate-art foils for a number of cards, Unhinged packs had a chance to contain Super Secret Tech, a card only available in the foil rare slot (though many times more common than other foil rares from the set) at collector number 141/140. 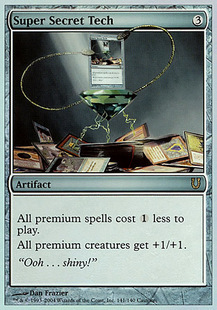 In Unstable, I predict we may see Wizards combine those ideas to create a handful of new Masterpieces. This time around, maybe they’ll be completely unique, or even absurdly unnecessary. 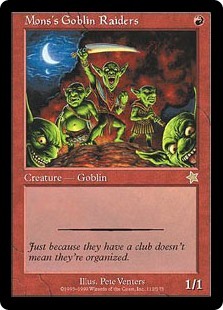 One of the earliest jokes in Magic (outside of Unglued) was the Starter 1999 printing of Mons’s Goblin Raiders at rare, and I would love to see it as a Masterpiece. Imagine the look on your friend’s face when they open one of the rarest cards in the set: a vanilla 1/1.